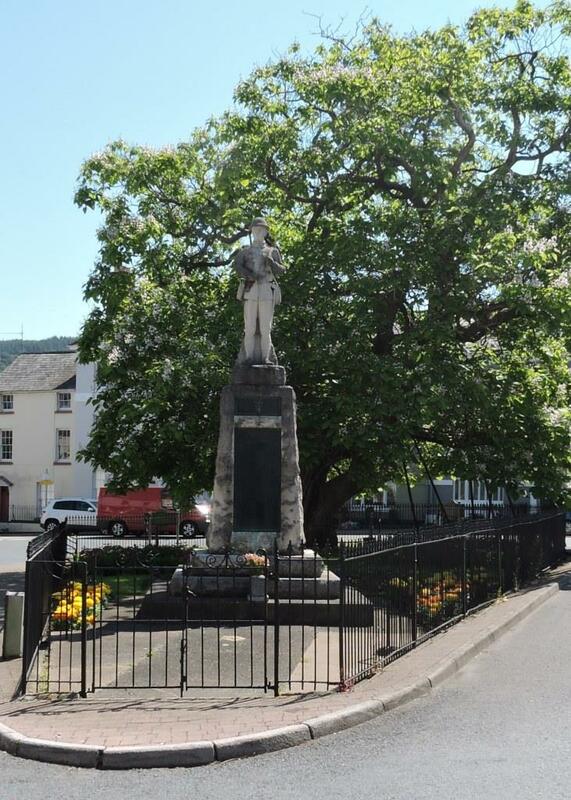 Monmouth town war memorial stands in the centre of St James’ Square in a small garden surrounded by metal railings. 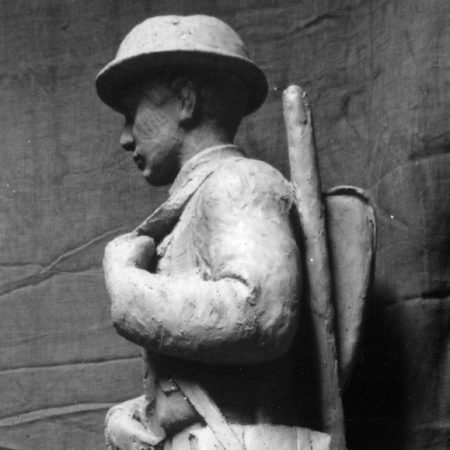 It is made of Portland stone and comprises a statue of an infantryman wearing his steel helmet and carrying full kit including rifle, back pack, ammunition pouch and water bottle. He stands on a tall rough hewn pedestal atop a tier of three steps, although originally there were only two steps. The names of the fallen of both world wars and the Korean war are now cast in bronze tablets fixed to the pedestal, though the original WW1 lettering was carved into the stonework ; Figure 1. The monument was designed by J. Reginald Harding with minor alterations by Harry Gregory of W. Clarke of Llandaff, the firm responsible for its production. Mr. Harding was a civil engineer, the nephew of Lord Llangattock. In 1914 Clarke’s had been responsible for making a memorial tablet to the late Lord Llangattock which was erected in Monmouth parish church which had been designed by J. Reginald Harding. The marble bust for this monument was sculpted by Sir William Goscombe John. 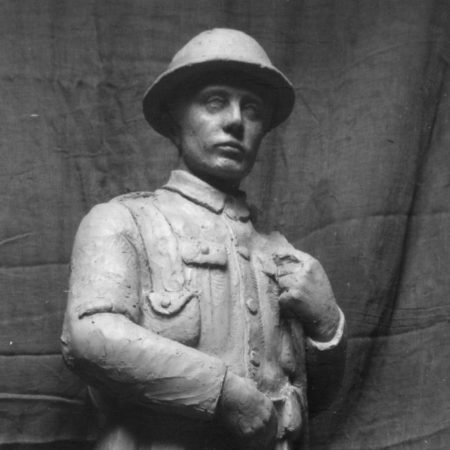 The statue of the infantryman was modelled and sculpted by William W. Taylor; Figure 2. Mr. Taylor finally received public recognition for sculpting the monument when the Monmouthshire Beacon published his obituary on 1st March 1935.The names recorded on the tablets have been listed on the Imperial War Museum’s website and by Ray Westlake (First World War Graves and Monuments in Gwent. Wharnecliffe 2001, pp. 117-9). 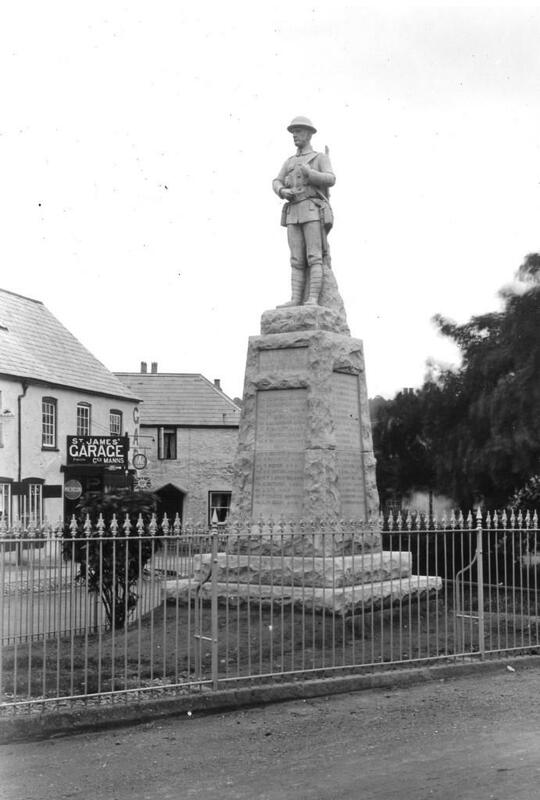 The story of the Monmouth war memorial can be found in the pages of the local newspaper, the Monmouthshire Beacon. 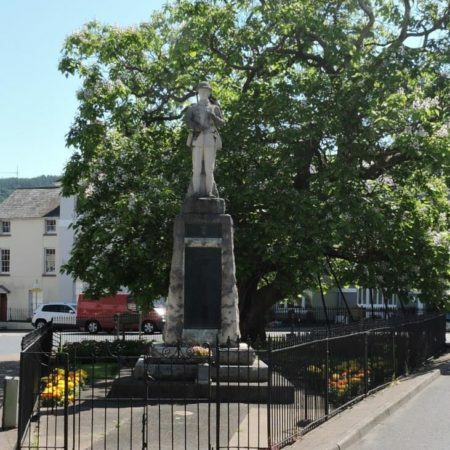 At a meeting of the Town Council on Monday 18th November 1918, a committee was formed to gather subscriptions for peace celebrations and a permanent war memorial for the town. The secretary elect was Mr. George B. Adamson and the treasurer Mr. C. H. Woodhouse. At this time Mrs Howard Arnott donated 100 guineas and by the end of the meeting £310.15s. had been collected. No decision had been made at this stage as to what form the memorial should take. At a meeting in January 1920 Mr. Adamson reported further contributions had been received and the Mayor, Mr. W. Sambrook, put forward the idea of extending the Wye Embankment as a suitable war memorial. This would have involved the demolition of houses and general town improvements. Others felt this was not at all a suitable form for a war memorial. By the following April about £400 is stated to have been collected but the committee had yet to organise a general collection. Two designs for a memorial tablet to be placed in the Shire Hall were rejected and the whole question of what form the memorial should take was still unresolved. At a meeting held in July of 1919 the Memorial Committee submitted a report on their considerations of the numerous schemes that had been put forward for a war memorial. Their favoured scheme involved the fencing off of four acres of Chippenham for the purposes of organised games and that the house and premises occupied by the Phoenix Coal Co. be purchased; an entrance made through Chippenham, with entrance gates from Monnow Street; on the pillars of which to be affixed a tablet containing the names of Monmouth men who had fallen. After heated discussion, hingeing largely on who was to be responsible for subsequent upkeep, the report was accepted. The scheme obviously never came to fruition. Clarke’s actually commenced work in earnest in August 1920. 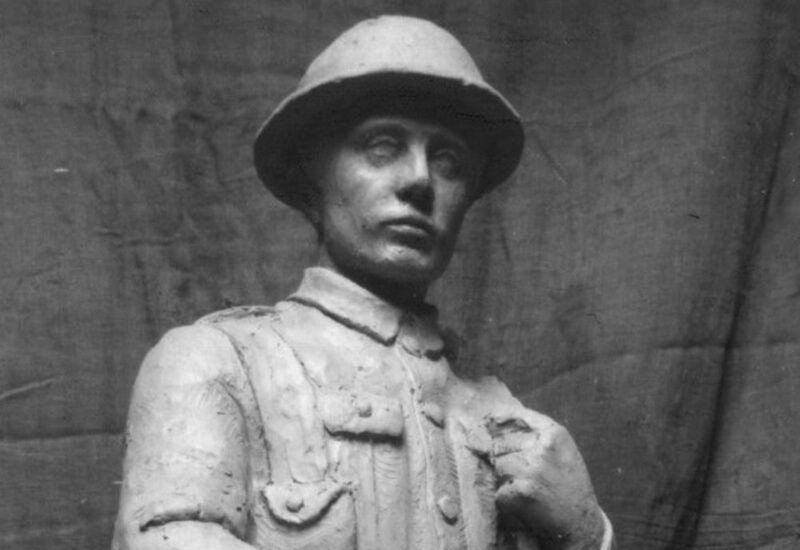 William Taylor spent a total of 304 man hours producing a scale model of the statue in clay; Figures 3a & b and a further 675 man hours on carving it from Portland stone with help from Mr. Ellis. The stone was obtained from Messrs. E. Turner and Sons, Portland. In December of 1920 a temporary shed had to be erected in Clarke’s yard to accommodate the works. Durnell and Llewellyn, with help from Dare worked on the lettering. Unnamed masons worked for a total of 1057 man hours helped by unnamed labourers for a further 566 man hours. Others who worked for a significant period on the project were Sid Pollard and Dando, the latter being responsible for overseeing the installation of the monument. The carpenter Kingston made a crate for transporting the statue. The monument was put in place in August 1921 with final touches and cleaning in September. In total about 3,720 man hours was spent on the project by the firm. The total cost of day works including materials and all expenses (including 2/- paid for the loan of a rifle) amounted to £583:15:7 and the final bill came to £725, representing a profit of about 24%. Day book and bill book records are appended. An interim payment of £500 was received on 3rd of October but final settlement was not received until 30th January 1922 as more funds had to be raised. 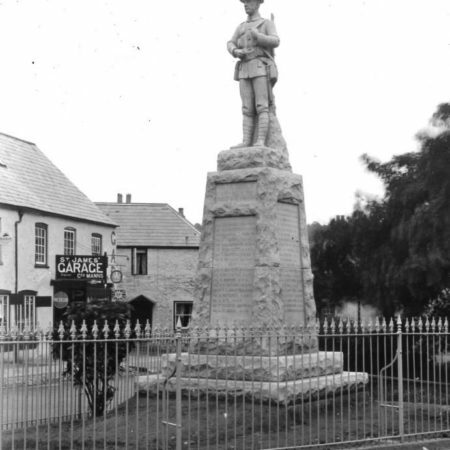 An archive photograph of the original monument as installed is shown in Figure 4. 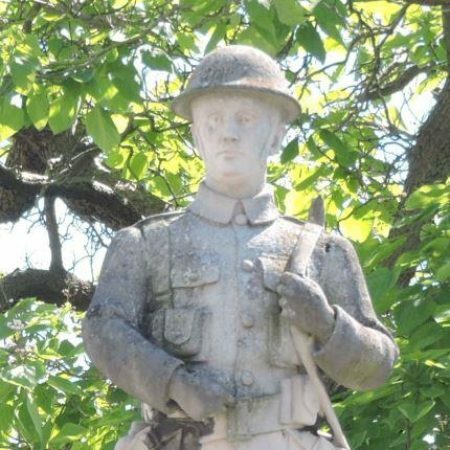 The memorial was unveiled on 6th October 1921 by Major Reade and dedicated by the Rev. Canon Harding. A copy of the programme for the unveiling is held in the archive. The event had full coverage in the local newspaper complete with a photograph taken by C.V. Hyam of the unveiling and together with portraits of the mayor Councillor A. T. Blake, Major Reade, D.S.O., M.C. and Mr. George B. Adamson. Before the war Mr. Reade had been headmaster of Monmouth Boys School. He joined the army as a private at the onset of hostilities rising to the rank of Major. After the war he returned to his former job.